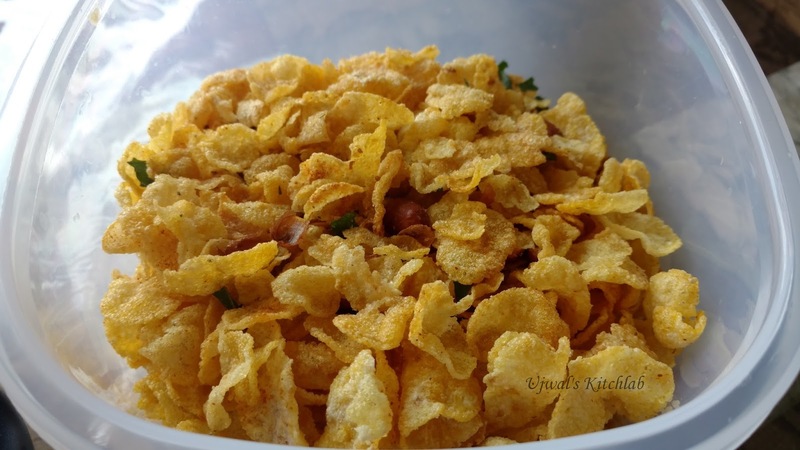 Corn mixture is one of the snacks that can be easily made at home. It needs very less ingredients and takes just 15-20 mins from start to finish. Kids love this snack as its not very spicy and very crunchy. You can use cashews, raisins , dry coconut flakes to this to make it more flavorful. 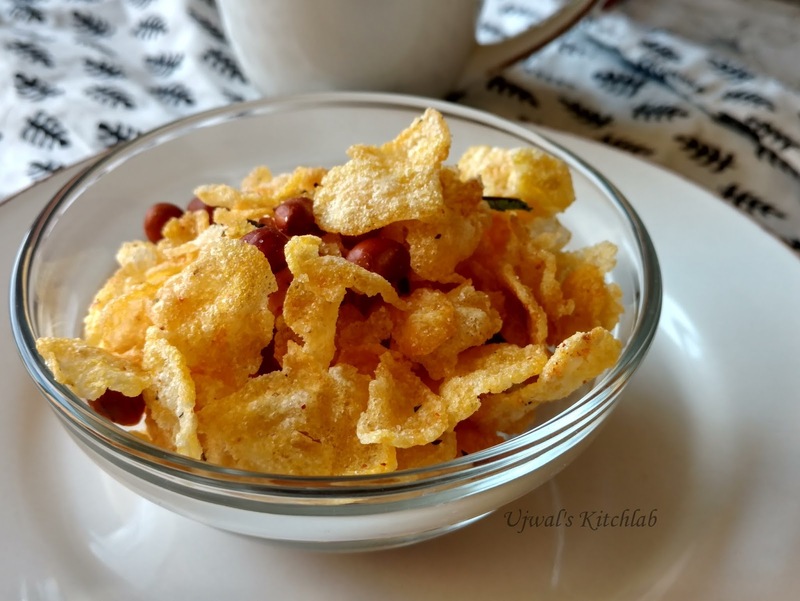 I Love it with just peanuts but do add raisins as my son loves them. 1) Heat oil. deep fry peanuts on low flame until they slit open slightly and look crisp. Drain and let it cool. 2) Deep fry curry leaves and green chilli until curry leaves crisp up. Drain and let it cool. 3) If using raisins or cashew deep fry them and drain. Let it cool. 4) In the same oil start deep frying the corn poha in batches until they fluff up. They don't take much time so keep an eye on them to prevent burning, Drain on a paper towel. 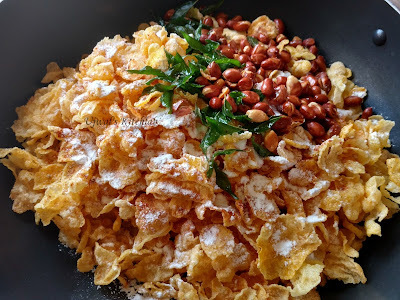 5) when the the fried corn flakes are still warm transfer them to a huge bowl and add the deep fried peanuts, curry leaves, green chilli, raisins and cashew if using , salt, powder sugar and red chilli powder. toss or mix gently so that the seasoning is evenly distributed. Check for seasoning and add as per your taste. 6) When cool transfer it into a clean air tight container and Enjoy! 1) You can make the mixture with deep fried thick poha instead of corn poha. 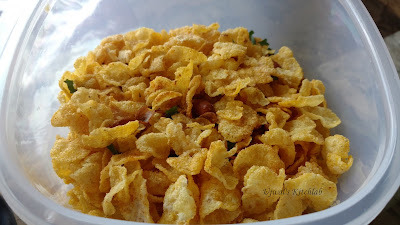 2) Increase the chilli powder if you prefer spicy snacks. 3) You can make a powder of roasted jeera and coriander powder as seasoning. My MIL used to make the mixtures with this powder. Shenvo is our favorite side to go with Poha or Upma. I was not very happy with the Sev that we got here at Indian stores. They do taste good but it lacks the flavor that I grew up on. 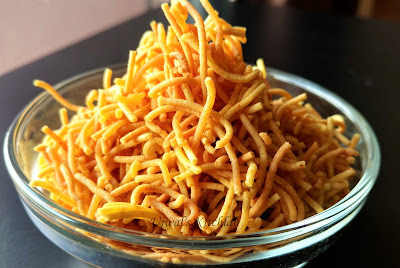 The Sev that is made at Mangalore has a wonderful aroma of Hing and Ajwain. I missed those here so much that I decided to try making at home. 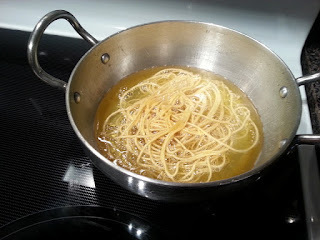 They are so easy to make that, once I made them at home we got hooked. Now we don't fancy the store brought ones. The advantage of making it at home are many price, quality of ingredients and portion control. It does not take much time to make these yummy Sev. 1) Dry roast the Ajwain till fragrant. Cool down and crush with a mortar and pestle. Sieve it. 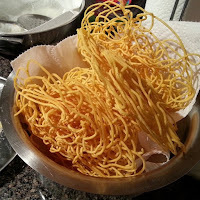 2) In a bowl whisk Besan, Rice flour, red Chili powder, salt, Ajwain powder, Hing powder. Add 2 tbsp of hot oil and mix. Add water little by little until it forms a sticky dough. Check the salt and spice and add more if required. 3) Heat oil. Grease the Sev mold and add the dough into the cylinder. Tighten. Press and make circles of Sev directly into the hot oil. When it stops sizzling turn over if needed. Keep an eye on it and make sure that does not burn. 4) Drain on tissue and let it cool. Once cooled crush it lightly and store in an air tight container.